Ghost Rider is an online slot game from Cryptologic's branded Marvel slots series. It is based on the character Ghost Rider. Johnny Blaze was a motorbike stunt rider who sold his soul to Satan in order to save the life of his mentor. In the process he was consumed by hellfire. His head became a flaming skull and he breathed hellfire from his mouth. It is for this reason that fire pervades the online slot game. The reels are set in flames and a ring of flames surrounds many symbols. 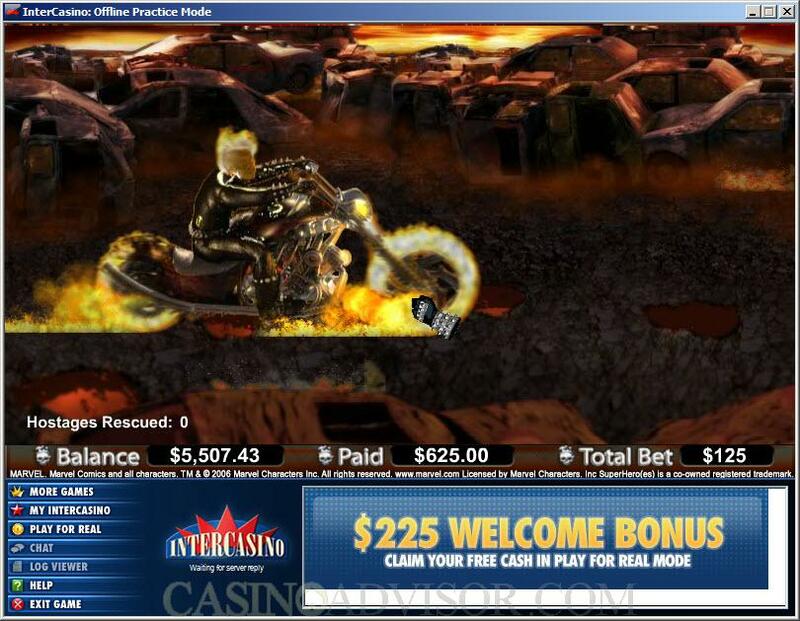 As is the practice in Marvel slots, the main character, Ghost Rider in this case, is the wild symbol and the Ghost Rider logo is the scatter symbol. Other symbols include Johnny Blaze in a spiked jacket, a motorbike with fiery wheels, a chain weapon, a spiked glove, a bat, a volcano and a Bible. 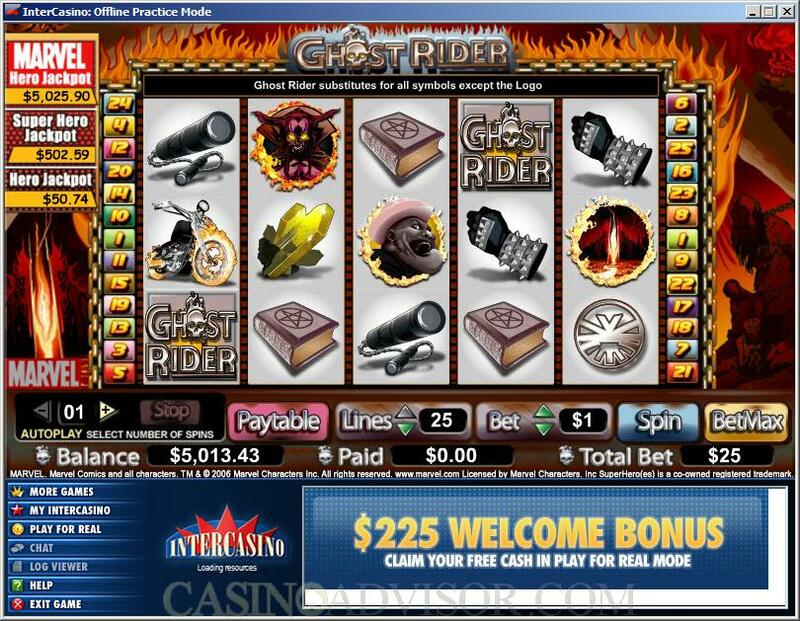 The Ghost Rider slot game has 5 reels and 25 paylines. The players can select the desired coin size by operating the arrows next to the coin size display. The allowable coin sizes in this slot game are 0.01, 0.02, 0.05, 0.10, 0.25, 0.50, 1.00, 2.00 and 5.00. The players are constrained to wager only one coin per payline. The players can enable up to 25 paylines. This can be done by operating the arrows next to the payline display. All 25 paylines can be enabled by clicking on the Bet Max button. 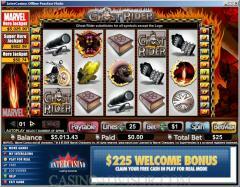 The Ghost Rider is the wild symbol and it offers the highest jackpot of 10000 coins. Unfortunately it does not act as a multiplier. The Ghost Rider logo is the scatter symbol. Two or more scatter symbols anywhere on the reels trigger the scatter payouts. Three or more scatter symbols anywhere on the reels trigger the bonus feature. In this feature the Ghost Rider has to save persons from burning cars. The Ghost Rider is on his motorbike with the wheels on fire. The sound of the motorbike can be heard as the Ghost Rider searches for people to rescue. He comes across three cars and the player has to select one of them. The player is given a random credit is for the person rescued. The credit can amount to 100 times the triggering bet. The rescue operation is conducted thrice in the bonus game. The three layer Marvel progressive jackpot is available in Ghost Rider. This jackpot is hit randomly without the need of aligning like symbols on paylines. Players who are hoping to win any of these jackpots are advised to wager with larger amounts because that gives a greater chance of hitting the jackpot. If the jackpot is hit elsewhere then a message flashes across the screen and the jackpot is reset to its starting value. Interested in reading more detailed information about Ghost Rider? If so Click Here for more details.